Earlier this season we heard a funny story about Eastern Screech Owls from a bird walk leader. He told of checking the Wood Duck boxes on his property one year and finding an Eastern Screech Owl inside one. The owl didn’t seem to mind his presence so he gingerly started to clear out the box around the owl. Still the owl didn’t move. He managed to clear out the box by gently moving the owl from one side of the box to the other as he cleaned. The roosting owl didn’t mind at all. Later, our trip leader said, he learned that if found while roosting in the daytime, Eastern Screech Owls don’t mind being handled and might even like to have a scratch on the back of the neck. Sure enough, the next nest season, when he went to clear out one of the Wood Duck nest boxes, he found a roosting owl. He gave it a neck scratch, which it seemed to enjoy. In the following years, to make nest box cleaning go a little bit faster, he would bring his wife out to the boxes with him. When he climbed up the ladder to clean out the box, if an owl was inside, he would pass the owl down to his wife to hold onto while he quickly cleared debris out of the box. I tried to find information about similar behavior online but I haven’t been able to find anything. The guide’s story sounds unbelievable to me, but extremely funny. Have you heard of something like this? Could it be true? Summer had yet to arrive in our part of the country when we left home yesterday. The high temp in our part of Lake County, Illinois was just 60°F whereas the normal is 76°F. Tomorrow & Saturday are predicted in the low 70’s. After driving south for the past two days, I know where summer has been hiding. OMG it’s hot here! This afternoon we had a hot, sweaty picnic at the lovely Georgia Veterans State Park where we were joined by curious Northern Mockingbirds and a few Common Grackles watching us from Spanish moss-covered trees. We took a short walk there after lunch and actually saw our first ever Tufted Titmouse. They range in our part of Illinois but for some reason they are kind of hard to find in our county. We’re now staying at a hotel close to the Space Coast with the main goal of seeing the Space Shuttle launch on Saturday morning. But first, some (hopefully good) birding! There is a group of Least Terns flying around the roof of our hotel, transporting fish and making a lot of noise. Are they feeding young? While trying to make a video of the tern shenanigans, this flock of White Ibis flew by. Can’t wait to see some more southern birds tomorrow! During our Saturday walk at Rollins, we saw this Sandhill Crane family (the same small family that we had previously observed) being divebombed by Red-winged Blackbirds. And those blackbirds aren’t kidding – see how they really smack into the adult cranes! Now we knew that cranes eat crustaceans, but we didn’t realize these meat-eaters would also be a threat to the Red-winged Blackbirds – or rather, their young. A post on Laura Erickson’s Twin Beaks blog (and this one) this week cleared that up though. Yikes. I’m digging into the archives for this one. 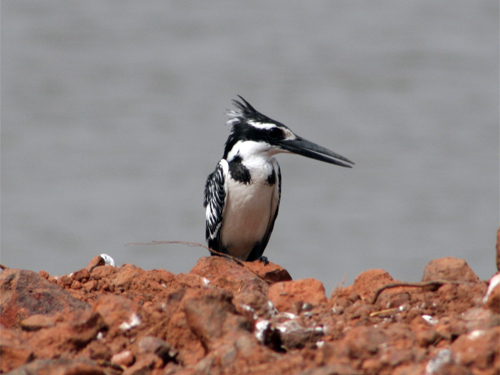 The Pied Kingfisher was one of the most abundant species we came across during our visit to the Gambia in January 2007. These guys are cute and noisy. We heard them almost everywhere we went if we were close to water. You can hear what they sound like here. We saw them perching in trees, where they would call one another, or, more interestingly, hovering above the water hunting for fish. Here’s one relaxing on the rocks between hunting sessions. 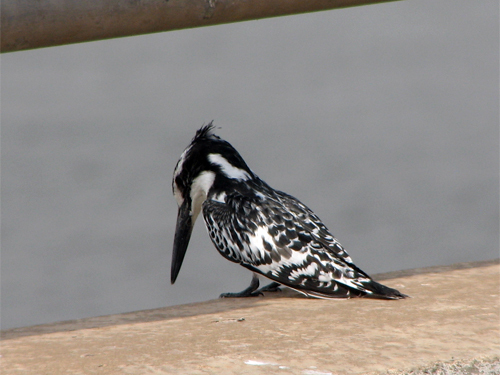 This one appears to be taking the easy route – hunting from the side of a bridge. Scouting before going out there and hovering is probably a good idea. This is how they look when hunting. They were so fun to watch! Be sure to check out the other bird photos submitted for this week’s Bird Photography Weekly. We had another walk at Rollins Savanna on Saturday. This time it was another bird walk sponsored by Lake-Cook Audubon (their last walk of the season). It was an overcast and unseasonably cool morning, with rain forecast for the early afternoon. Despite the weather, over 45 birders of all levels joined in the walk. Here are most of us at the start of the walk. 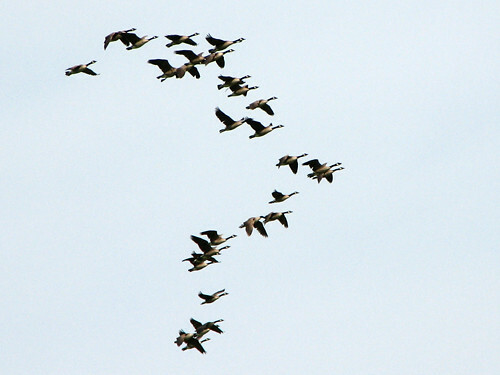 We did lose quite a bit of birders along the way – including us! We walked ahead of the group just shortly after the halfway point in the loop trail, after three hours of birding. Because the group was so large, we split in two. 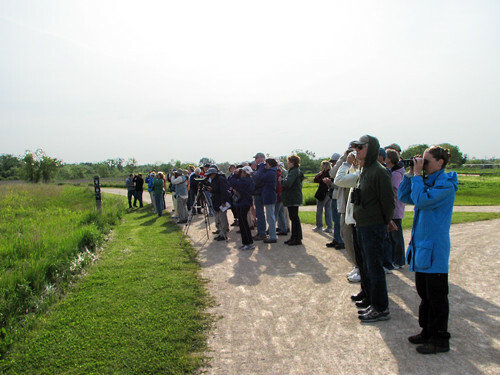 Even then, we were still birding with a huge group. Here’s our half just shortly after we began. By the way, I’m not sure you’ve noticed (ha! 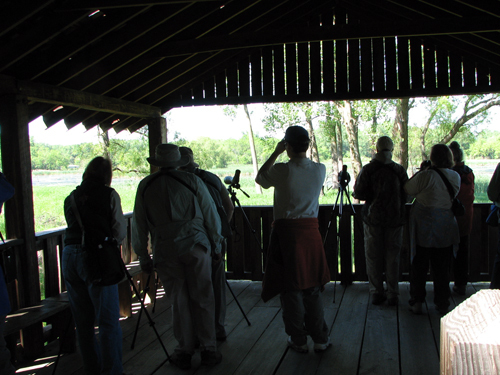 ), but I really like to take photos of birders. I don’t exactly know why. When we went birding in Holland we never went with a group so I would always get a kick out of seeing photos in online newspapers of birders all looking in one direction through their binoculars or focusing their cameras on the same thing. 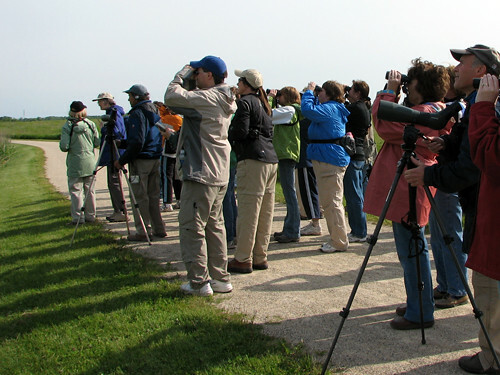 I just like birding as a hobby so much so I guess seeing photos of people doing it in a big group makes me smile. 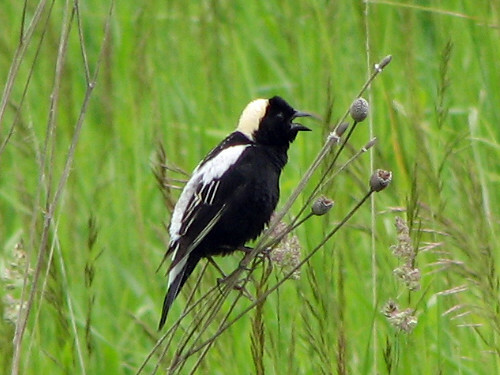 On Saturday the Bobolinks that had been so prevalent during our last walk were a bit more subdued. 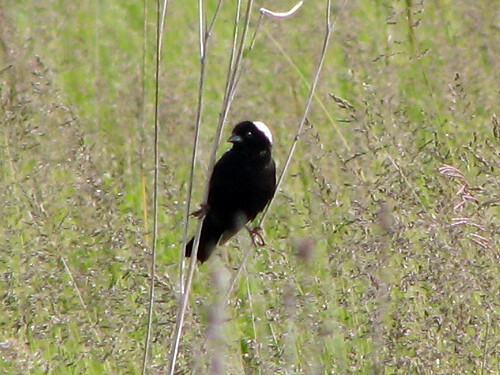 We still saw many males singing, but we didn’t observe any females at all. A few of the males were quite bold, giving us great views from perches close to the trail. The Meadowlarks, on the other hand, seemed to be a bit more vocal than they were the last few times we were at Rollins. We heard these almost everywhere during the walk, but they kept their distance. 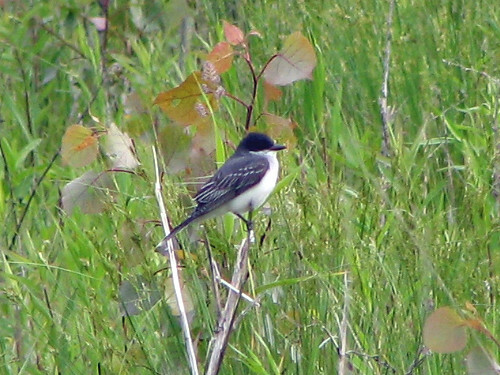 We noticed Eastern Kingbirds at at least three different locations, including what seemed to be two pairs. 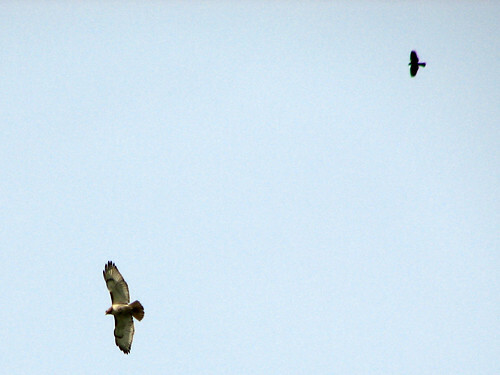 We saw lots of birds flying high over the savanna, including Great Blue Herons, Great Egrets, a Marsh Harrier, plus this Red-tailed Hawk being pestered by a Red-winged Blackbird and a flock of Canada Geese. In total we counted 37 observed species, including three lifers: Sedge Wren; Northern Rough-winged Swallow; and a fleeting look at a Virginia Rail. 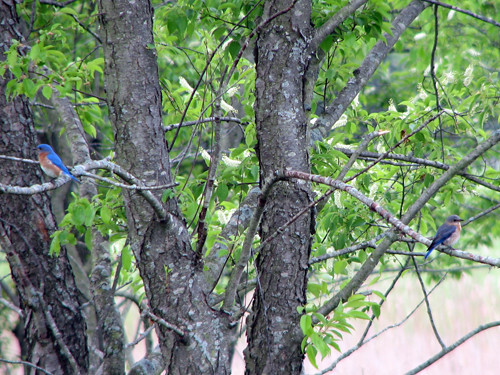 We saw these Eastern Bluebirds at Rollins Savanna last Sunday. 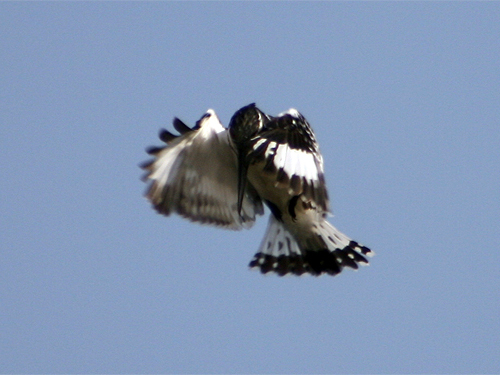 The male had just been pestered by a Tree Swallow when the female flew in. They didn’t look happy to see each other. Mom & dad Canada Goose have to keep nine little ones in line. Seen in late April on the grounds of the Lake County Discovery Museum. 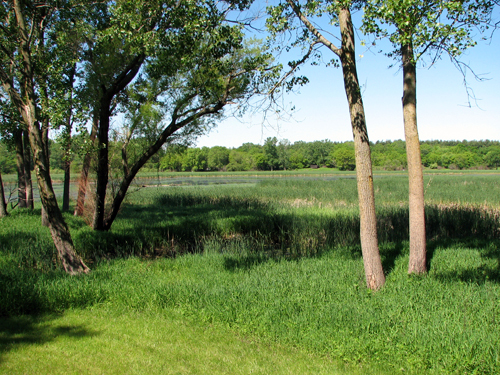 On Sunday we went out again with Lake-Cook Audubon, this time to an outing at McHenry Dam, which is part of Moraine Hills State Park in McHenry County. 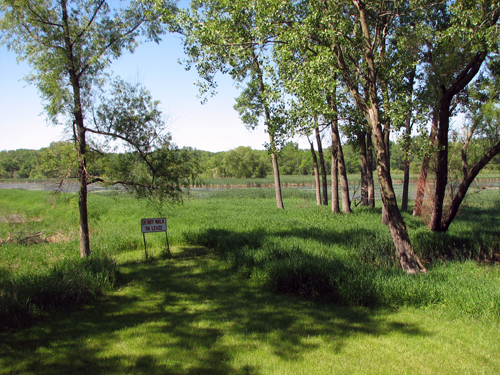 We took the Fox River trail which passes through meadow, marsh, wetland and forest habitat. There are even two observation decks, including this one that almost looks like a blind! Arthur and I noted 37 observed species, with six lifers! Arthur also recently started using Birdstack (I started a while back but never finished) to record all bird species we have observed. Our ‘actual’ life list is now at 442 species total. 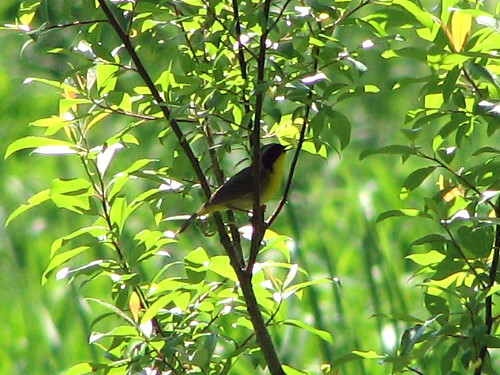 On one part of the trail, we observed a Common Yellowthroat, one of our six lifers on the outing. The next 8 or 10 birds we saw were Yellowthroats, but each time we saw the movement of a bird in the bushes, we looked hopefully through our bins, looking for a new species. But they were all Yellowthroats. Well, they are Common – it’s true! 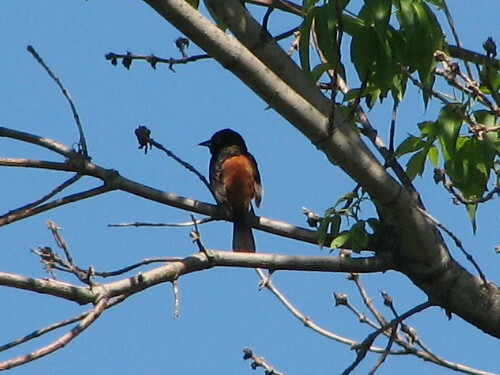 We also ran back to see this lifer Orchard Oriole that a few stragglers in our group found in a tree. 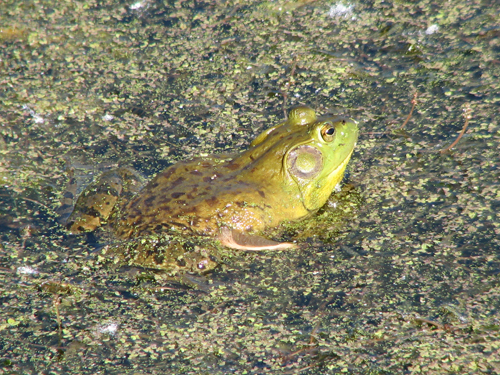 Besides birds we also saw lots of turtles, a rather large muskrat, and this huge bullfrog. Another great outing with Lake-Cook Audubon! My visitors came from *where* in May?! Here are some of the more interesting search terms that brought visitors to this site during May. You can see previous editions of this monthly post here. Searches for Magnificent Frigatebird-related information continue to bring visitors. Last month people searched for frigatebird bible, frigate birds natural enemies, magnificent frigate bird for children, frigate bird food chain, and how does a magnificent frigate reproduce? (what are the options for birds?). Interesting and funny typos for the month include hummbird food, alalbama birdhouse, pigeon fancers, magnificient riffle bird, bird watching supplys, birders termanology, outdoor wildlife bird suppyies, and my favorite, sworowski monoculr. I noticed a lot of searches for birdhouses and birdfeeders last month. Some of the search terms sound pretty funny to me, but most of them were for houses or feeders that are actually available for purchase, like these: bird house airstream; hummsicle; pirate birdhouse; and diving cat bird bath. My favorite funny search terms for May were do loons breed in illinois? (a question I had myself a couple of months ago), rectangle scope (ouch! 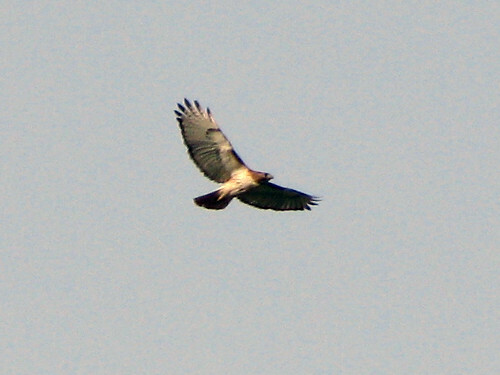 ), passerine turkey, and quiet birding clothing. 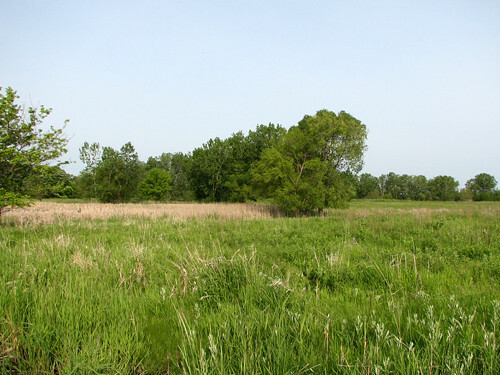 Last week I was wondering if we’d ever cycle to our favorite local preserve, Rollins Savanna. Well, the weather was perfect on Saturday so we went for it! 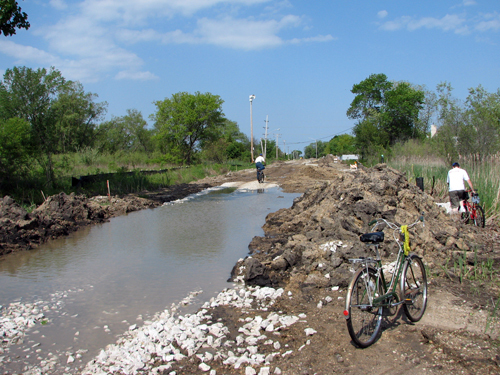 There was a bit more mud than expected, but there was also a lot more bike path than we dreamed of, so the trip was a big success! I wrote about it on our personal blog – go check it out!